End of year gifts, teacher gift, Mother's day gift, etc. Create a special end of year gift for a teacher, make a beautiful work of art for a Mother’s Day gift, and create artwork to illustrate seasonal poetry. 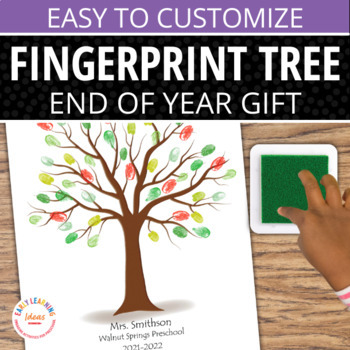 My customizable fingerprint tree templates are perfect for many projects in your school, Sunday school classroom, or home. Two full page templates are included. 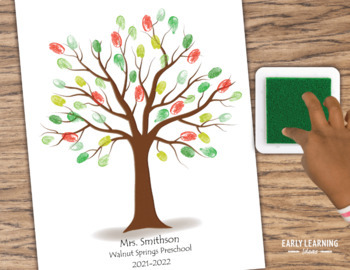 One has three lines of customizable text that will be perfect for making a special memento or end-of –year gift for a teacher. The second template contains four lines of customizable text and can be used with short poems or Bible verses. The uses are only limited by your imagination. Simply add your personal text and print on 8.5 x 11" paper of your choice. Fonts and colors cannot be altered. Please see preview file. 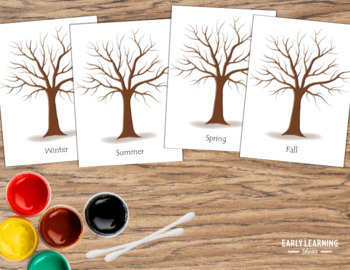 Create a Four Seasons craftivity with smaller tree templates. Trees can be printed with or without the names of seasons. I have included both autumn and fall so that you can choose between the two. Buds, blossoms, leaves, and/or fruit can be added to the trees with fingerprints, cotton swabs, or pencil erasers. Directions and ideas are included. Instructions to make your own stamp pads are also included. If you like this product, you may also like my End of Year Memory Book. Do you want to be the first to know when I add new hands-on resources to the store? Be sure to follow me.